Every client is different, and there is rarely a one-size-fits-all solution, but there are a few organizing tools I use so frequently that I can't live without them. 1. Label Maker - My love affair with my label maker borders on obsession. My husband jokes that I may one day label him, but I can't think of an easier way to label and identify your items. I label everything from files, binders, bins, spices, closets, drawers and pantries. It makes scanning for items easy, and I know exactly where to put things away. 2. Clear plastic bins with lids - These containers come in a wide variety of sizes and store almost anything. The perfect solution for storing like things together, these bins are cheap, reliable and durable. I insist on clear bins so I can easily see the items inside. 3. 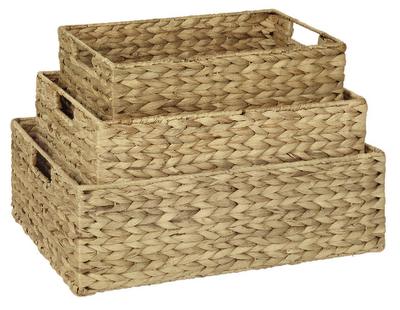 Baskets - Baskets are a great decorative solution for open storage. They come in a range of beautiful colors and textures that work in a wide variety of decors. 4. Lazy Susan - This little turn table is the perfect combination of convenience and organization. It provides easy access to all items on it with a simple spin. I've used it in kitchen cabinets to organize spices, bathrooms to hold toiletries and offices to hold supplies. 5. 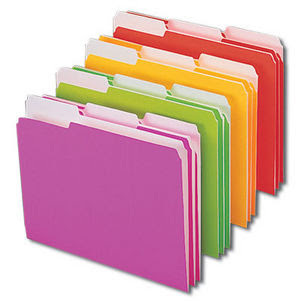 Color coded file folders and file hangers - File folders and hangers are the perfect solution for storing paperwork, but I like to go one step further and color code the files for different categories. For examples, I use red for financial records, yellow for home related papers, blue for electronics, etc. The color coding makes it easy to divide and scan for things instead of reading every little tab. 6. Drawer dividers - Without drawer dividers, all my stuff in my office and kitchen drawers would slosh around every time I opened and closed the drawers. 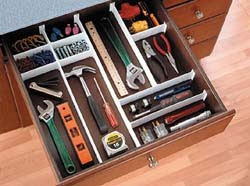 Drawer dividers help keep things in their place so you don't have to wade around the drawer to find that one item.